We provide wireless security radio call boxes for these applications: Shopping malls Golf Courses Hospitals Schools, colleges, libraries Large facilities with unattended parking lots or outlying areas Take a look at a general classification of wireless call boxes that may be configured to fit your specific needs. They communicate with your existing radio base or to a new system we provide. Your choice. Emergency or assistance communication units are a vital part of any serious security system. CALLBOX24 has taken this idea and integrated it with key aspects of security by offering highly visible security units with communications, lighting and CCTV alarming capabilities. CALLBOX24 Wireless Callboxes are easy and economical to install and provide call box protection without the costly trenching or boring required by most other systems. With CALLBOX24 Wireless Callbox Systems, affordable parking and remote area protection is a reality for corporations, entertainment, golf courses, malls, parks, transit, college and hospital campuses. CALLBOX24 works with any two-way frequency and provides automatic location alarming, two-way voice, intercom and hands free listening to either dispatch or patrolling officers with portable or base radios. 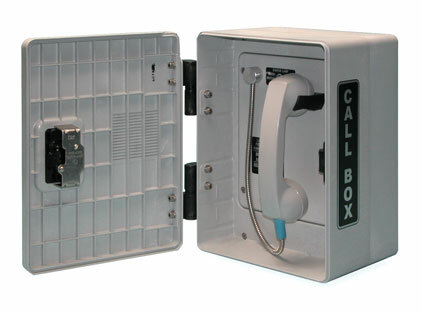 CALLBOX24 technology facilitates faster, more informed physical responses. Three highly visible, standard decal options are available (or decals can be provided with custom copy) on vandal-resistant high tensile enclosures. ALL MAJOR FACILITIES NEED THE CALLBOX24 AND SINCE IT WORKS WITH YOUR EXISTING RADIO NETWORK THERE IS NO NEW LICENSING REQUIRED POWER IS NEVER THE ISSUE WITH THE CALLBOX, USE WHATEVER IS READILY AVAILABLE AT THE SITE CALLBOX24 IS FAST AND EASY TO INSTALL. SEE THESE IMPRESSIVE SPECS AND ORDER YOURS TODAY! From hospitals and school campuses to malls and corporations, Call24 provides dependable security in even the most remote areas. Call24 has many unique benefits and standard features which benefit both your employees and customers. To best suit your individual needs, Call24 stations have a variety of power-supply options, monitoring and control options, and can be mounted just about anywhere. Solar Charge system provides uninterrupted call box operating power when tied to (dusk to dawn) switched lighting power circuits. Solar works anywhere the sun shines! 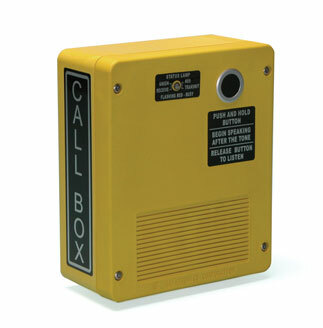 CALLBOX24's signal range is equivalent to the radio system that supports it. Alternate antenna systems are available for expanding range. PERFECT FOR GOLF COURSE INSTALLATION FOR FOOD ORDERS AND SECURITY/ CLIENT PROTECTION AS WELL. Indoor units are for protected installations such as parking structures, garages, stairwells, covered gate entrances, etc. Do you have an existing radio system to talk to? How far will it be from the box to the base location? How many call boxes are you looking for? Do you need to identify which call box is calling in? Will this be for Emergency or Non-Emergency type use? Do you have power available at the call box location? CALLBOX24 IS FAST AND EASY TO INSTALL. SEE THESE IMPRESSIVE SPECS AND ORDER YOURS TODAY! "Available in A/C or Solar"